Can I transfer my business through my will? How can I determine what my business is worth for estate and gift tax purposes? What is a family limited partnership, and will it help reduce estate taxes? As a business owner, you’re going to have to decide when will be the right time to step out of the family business and how you’ll do it. There are many estate planning tools you can use to transfer your business. Selecting the right one will depend on whether you plan to retire from the business or keep it until you die. Perhaps you have children or other family members who wish to continue the business after your death. Obviously, you’ll want to transfer your business to your successors at its full value. However, with income, gift, and potential estate taxes, it takes careful planning to prevent some (or all) of the business assets from being sold to pay them, perhaps leaving little for your beneficiaries. Therefore, business succession planning must include ways not only to ensure the continuity of your business, but also to do so with the smallest possible tax consequences. Some of the more common strategies for minimizing taxes are explained briefly in the following sections. Remember, none are without drawbacks. You’ll want to consult a tax professional as well as your estate planning attorney to explore all strategies. If you are prepared to begin transferring some of your business interest to your beneficiaries, a systematic gifting program can help accomplish this while minimizing the gift tax liability that might otherwise be incurred. In 2018, you can give up to $15,000 per year, per recipient without incurring gift tax. By transferring portions of your business in this manner, over time you may manage to transfer a significant portion of your business free from gift tax. Clearly, the disadvantage of relying solely on this method of transferring your business is the amount of time necessary to complete the transfer of your entire estate. In addition, Section 6166 of the Internal Revenue Code allows any estate taxes incurred because of the inclusion of a closely held business in your estate to be deferred for 5 years (with interest-only payments for the first four years), and then paid in annual installments over a period of up to 10 years. Installment payments include both principal and interest. 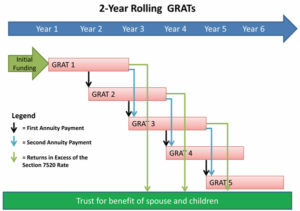 This allows your beneficiaries more time to raise sufficient funds or obtain more favorable interest rates. The business must exceed 35% of your gross estate and must meet other requirements to qualify. When you sell your business interest to a family member or someone else, you receive cash (or assets you can convert to cash) that can be used to maintain your lifestyle or pay your estate taxes. You choose when to sell–now, at your retirement, at your death, or anytime in between. As long as the sale is for the full fair market value (FMV) of the business, it is not subject to gift tax or estate tax. But if the sale occurs before your death, it may be subject to capital gains tax. Remember, you are bound under a buy-sell agreement: You can’t sell or give your business to anyone except the buyer named in the agreement without the buyer’s consent. This could restrict your ability to reduce the size of your estate through lifetime gifts of your business interest, unless you carefully coordinate your estate planning goals with the terms of your buy-sell agreement. Until recently, exchanging property for an unsecured private annuity allowed you to spread out any capital gain realized, deferring capital gains tax. However, this tax benefit has generally been eliminated. If you’re considering a private annuity, be sure to talk to a tax professional. As a partner or co-owner (private shareholder) of a business, you’ve spent years building a valuable financial interest in your company. You may have considered setting up a buy-sell agreement to ensure your surviving family a smooth sale of your business interest and are looking into funding methods. One of the first methods you should consider is life insurance. The life insurance that funds your buy-sell agreement will create a sum of money at your death that will be used to pay your family or your estate the full value of your ownership interest. 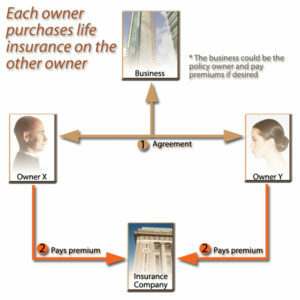 When using life insurance with a buy-sell agreement, either the company or the individual co-owners buy life insurance policies on the lives of each co-owner (but not on themselves). If you were to die, the policyowners (the company or co-owners) receive the death benefits from the policies on your life. That money is paid to your surviving family members as payment for your interest in the business. If all goes well, your family gets a sum of cash they can use to help sustain them after your death, and the company has ensured its continuity. In an entity purchase buy-sell agreement, the business itself buys separate life insurance policies on the lives of each of the co-owners. The business usually pays the annual premiums and is the owner and beneficiary of the policies. 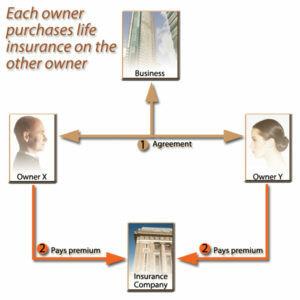 In a cross purchase buy-sell agreement, each co-owner buys a life insurance policy on each of the other co-owners. Each co-owner usually pays the annual premiums on the policies they own and are the beneficiaries of the policies. If your company has a large number of co-owners, multiple policies must be purchased by each co-owner. A wait and see (or hybrid) buy-sell agreement allows you to combine features from both the entity purchase and cross purchase models. 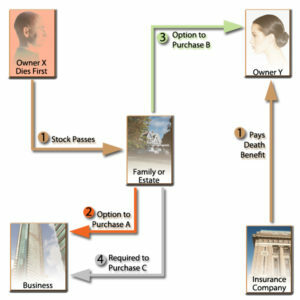 The business can buy policies on each co-owner, the individual co-owners can buy policies on each other, or a mixture of both methods can be used. The amount of insurance coverage on your life should equal the value of your ownership interest. Then, when you die, there will be enough cash from the policy proceeds to pay your family or estate in full for your share of the business. But if all that is affordable is insurance coverage for a portion of your interest, you might want to go ahead and fund that amount. Later, the company may be able to increase the amount of insurance or use additional funding methods. In the meantime, the agreement should specify how your family or estate will be paid. What if the insurance proceeds turn out to be less than the value of your business interest, due to growth in the business? Your surviving family members might end up getting less than full value for your business interest. Your buy-sell agreement should specify how the valuation difference will be handled. Conversely, the insurance proceeds might be greater than the value of your business interest when you die. Your buy-sell agreement should address this potential situation upfront and specify whether the excess funds will belong to the business, the surviving co-owners, or your family or estate. Should group life insurance be used? Using a company’s group life insurance plan to fund a buy-sell agreement is generally not recommended. Normally, group life insurance premiums are tax deductible to the company. But premiums are no longer deductible if the business is the beneficiary. For policies issued after August 16, 2006, the death benefits of life insurance on the life of an employee payable to the employer/policy owner may be subject to income taxes unless an exception applies. Assume your business is a corporation or is taxed as one. When one of your co-owners dies, his or her estate becomes the owner of the insurance policies covering you and the other co-owners of the business in a cross purchase agreement. If these policies are then transferred to the surviving co-owners to pay for future buyouts, a transfer-for-value (gain) may occur, and a portion of the proceeds received from the transferred policies may be taxable. If a policy is canceled (surrendered) for cash to buy out your interest while you are living, any gain on the policy is subject to federal income tax for the policyowner. Gain includes all policy loans outstanding at the time of surrender. Also, the policy may carry surrender charges. The proceeds received by a C corporation under an entity purchase agreement may be subject to the AMT. Each year, the premiums on the policies must be paid, or the insurance will lapse. So monitor premium payments carefully. Your buy-sell agreement should include a feature requiring ongoing proof of payment. Also, review the amount of insurance regularly. The insurance coverage may have to be increased periodically to reflect increases in the value of the business. If additional insurance is not possible, another funding method should be established. Finally, periodically check the financial rating of your insurance company. The policies funding your buy-sell agreement will do your family no good if the insurer becomes insolvent. You may have a great buy-sell agreement in place at the company where you are a partner or co-owner–one that clearly stipulates how much your family will be paid for your share of the business interest in the event of your death. It may also cover early retirement and the buyout terms under those circumstances. But what if you become disabled long before you are likely to die or retire? Insurance industry statistics show that the chance of you or one of your co-owners sustaining a long-term illness or injury (over one year) before age 65 is much greater than the odds of any one of you dying prematurely. Disability income insurance may provide a solution. If you were to suffer a severe injury or develop some type of long-term illness, you would probably be unable to earn a paycheck during that time. Disability income insurance is a salary-continuation agreement that replaces a portion of your income while you are injured or ill. Disability insurance with your buy-sell agreement provides the funds to allow your company to continue paying your salary or to completely buy your share of the business if your disability is permanent. Keep in mind that disability insurance is designed to protect you in the event of a long-term illness or injury. So, a disability insurance policy includes an elimination period (i.e., a waiting period between the time you become sick or injured and the time any benefits are paid). Some policies call for waiting periods as long as one or two years, so you will need to depend on your savings and other investments for a considerable period of time. Depending on the type of policy, you can receive benefit payments in either a lump sum, installment payments, or a combination of the two. Disability insurance should generally be used in addition to the funding method you have chosen for the purchase of your business interest at your death or retirement. You should make sure that any conflict between the provisions of your disability income insurance policy and your buy-sell agreement is eliminated at the outset. The buy-sell agreement should contain the same definition of disability as your disability policy. Determine when the agreement requires a complete buyout after you become sick or injured. Also, coordinate the waiting period, how benefits are paid, and how you may be able to buy your shares back if you recover from your illness or injury. If your buy-sell agreement is an entity purchase (stock redemption) plan, the company itself buys disability policies for each of the shareholders or partners. The company is the owner, premium payer, and beneficiary of the policies. With a cross purchase (crisscross) agreement, you and your co-owners agree as individuals to purchase the business interest of any co-owner who becomes disabled. 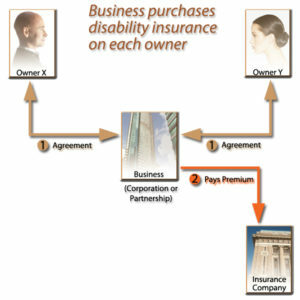 Under the terms of the agreement, you buy a separate disability policy on each of the other co-owners; in turn, each co-owner buys a policy on you. Each of you is the owner, premium payer, and beneficiary of the policies you have purchased. Be aware that tax consequences may arise if the company pays the premiums on policies under a cross purchase agreement. A wait and see (hybrid) buy-sell agreement allows you to combine features of both an entity purchase and cross purchase agreement. The greatest advantage offered by using disability insurance with your buy-sell agreement is that you can receive the full value of your business interest if you become disabled before your death or normal retirement. For example, say you become permanently disabled in an auto accident. You are unable to work and want to sell your interest in the business you helped establish, but the company doesn’t have the cash to pay you right now. Without disability coverage in this circumstance, you might be forced to go outside the company to sell your business interest. You could end up selling the interest for less than it is worth. Funding your buy-sell agreement with disability insurance assures that the other co-owners will buy your interest, names the conditions under which they will purchase your interest, and provides the money to pay you a fair price. If your injury is not permanent, disability insurance will provide income protection for your family while you are recovering. What are the drawbacks of using disability insurance? Insurance premiums are not tax deductible. It makes no difference if the payments are made by the business itself or the individual owners. Insurance companies may consider you uninsurable–ineligible for disability insurance–due to factors such as your age, health problems, high-risk hobbies, or employment in certain occupations. Disability insurance can be used only if you’re sick or injured. There is no policy benefit available if you die or retire from the business when you’re healthy. What happens if you recover from your disability? It’s possible that you could recover from your illness or injury after you’ve already sold your business interest under your buy-sell agreement’s disability clause. If this happens, you could find yourself without a business, career, or income. Make sure that your buy-sell agreement addresses whether you’ll be eligible to buy your shares back if you recover after the waiting period. The agreement should contain a schedule specifying how your interest will be transferred back to you. Because it is possible that you’ll recover from your disability, it is generally advisable to set up a long waiting period before the policy pays salary continuation benefits or triggers the purchase of your share of the company. This reduces the chance that you may recover from your disability after having sold your business interest. In addition, longer waiting periods reduce the policy premiums. Remember that the disability insurance with your buy-sell agreement will provide you with no benefit if the policy is allowed to lapse. Make sure that all required premiums are regularly paid. You don’t want to leave yourself and your family unprotected at a time when you’re sick or injured. While you’re at it, check up on the other funding components of your buy-sell agreement. And if the agreement is not fully funded, push to have this done as soon as it is financially feasible for the company. Finally, as the company grows, it’s important to periodically review the buy-sell document and the funding vehicles to ensure that they’re keeping pace with the current value of your business. What happens to stock basis of remaining shareholders? 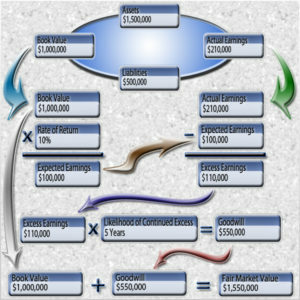 Basis increases by amount equal to price paid by shareholder for stock No increase in shareholder’s basisValue of stock owned by remaining shareholders increases when corporation retires stock or holds as treasury stock No increase in shareholder’s basisValue of stock owned by remaining shareholders increases when corporation retires stock or holds as treasury stock. The general rule is that the party with the obligation to make the purchase of the business interest at an owner’s death is the party that should be the beneficiary of the funding life insurance policy. 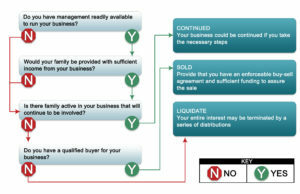 As such, the logical beneficiaries for each form of buy-sell agreement are shown below. Yes, you can use your will to transfer your business interest after your death. You can also use your will to specify a long-term succession plan for your business if, for instance, you want one of your children (who may be currently active in the business) to take over and run it when you’re gone. Without such a clause in your will, your interest could possibly be distributed equally to all of your children, even though you did not intend that result. A disadvantage of transferring your business through your will is that the full value of your interest will be included in your taxable estate. Unless you have made provisions for additional liquidity (e.g., by using life insurance), your heirs may be forced to sell the company just to pay the estate taxes. Assets disposed of through a will are subject to probate, the court-supervised process of administering a will. Probate can be expensive and time consuming. It could also result in business interruptions, which in turn could result in a loss of customers and employees if confusion develops over who’s running the business and how it will continue to operate. The probate process is also public, which may allow others to discover details about your estate that you would rather not disclose. Talk to your lawyer and your financial professional about your business interest and what you would like to happen to it at your death. Transferring your interest through your will is just one method that can be used. Other options (or combinations of options) can also be used to accomplish your wishes. Some methods may allow you to equalize distributions to your heirs without splitting up the business. Some can help you minimize the taxable value of your business interest. A buy-sell agreement can be drafted now to establish a plan for the future succession of your business interest. Trusts may also be used to help accomplish your goals. All of these strategies take time to plan and implement, so the best time to begin planning is now. A buy-sell agreement is a contract that provides for the future sale of your business interest or for your purchase of a co-owner’s interest in the business. Buy-sell agreements are also known as business continuation agreements and buyout agreements. Under the terms of a buy-sell agreement (assuming you are the seller), you and the buyer enter into a contract for the transfer of your business interest by you (or your estate) at the occurrence of a specified triggering event. Typical triggering events include death, disability, and retirement. Ideally, buy-sell agreements are fully funded, and life insurance is frequently used for this purpose. After determining the value of the business, you, your advisors, and the other parties to the agreement will determine the best way to fund the transaction, and the triggers appropriate for your business situation. If you own a business and are concerned about how the death of a co-owner might affect its operation, a funded buy-sell agreement can help by ensuring that you will be able to purchase your partner’s share, eliminating any doubts about the continuation of the business. You can also avoid the dilemma of being in business with your partner’s survivors. There are also costs and possible disadvantages involved in establishing a buy-sell agreement. One such disadvantage is that the agreement typically limits your freedom to sell the business to outside parties. If you think that a buy-sell agreement might benefit you and your business, consult your attorney and financial professional about the pros and cons of setting one up. Determining the value of your business is something you should not attempt to do on your own, especially because the IRS could challenge your valuation. Even the IRS acknowledges that no one true fair market value (FMV) exists for a closely held business. There are appraisers who specialize in determining the value of businesses. Your CPA may be one of these specialists or know someone who is. FMV is defined by the federal estate and gift tax regulations as “the price at which the property would change hands between a willing buyer and a willing seller, neither being under any compulsion to buy or to sell and both having reasonable knowledge of relevant facts.” It is the sale price that a hypothetical buyer and seller would reach, not necessarily the price that the actual owner would agree to or the price that an actual buyer might be willing to pay. You may have had your business appraised in the past for another purpose. As tempting as it might be, don’t use an old appraisal for a new transaction. The purpose of the appraisal can affect the valuation assigned, and time can change the factors that go into the appraisal calculation. A number of different methods exist for determining the FMV for a closely held business. Generally, only an appraiser will know how to analyze these factors to reach a conclusion as to the FMV of your business. A family limited partnership (FLP) is a partnership created and governed by state law and generally comprises two or more family members. As a limited partnership, there are two classes of ownership: the general partner(s) and the limited partner(s). The general partner(s) has control over the day-to-day operations of the business and is personally responsible for the debts that the partnership incurs. The limited partner(s) is not involved in the operation of the business. Also, the liability of the limited partner(s) for partnership debts is limited to the amount of capital contributed. 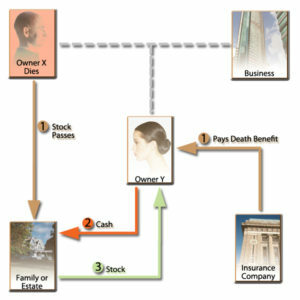 An FLP can be a powerful estate planning tool that may (1) help reduce income and transfer taxes, (2) allow you to transfer an ownership interest to other family members while letting you keep control of the business, (3) help ensure continued family ownership of the business, and (4) provide liability protection for the limited partner(s). An FLP is often formed by a member(s) of the senior generation who transfers existing business and income-producing assets to the partnership in exchange for both general and limited partnership interests. Some or all of the limited partnership interests are then gifted to the junior generation. The general partner(s) need not own a majority of the partnership interests. In fact, the general partner(s) can own only 1 or 2 percent of the partnership, with the remaining interests owned by the limited partner(s). Limited partnership interests that are gifted to other family members are generally valued at less than the full fair market value of the underlying assets. That is, reasonable discounts to the value of the limited partnership interests are permitted for lack of marketability and lack of control. This means that by gifting the assets via a limited partnership interest instead of an outright transfer of the business assets themselves, you may be saving gift and estate taxes. At death, only the value of your ownership interest in the partnership will be included in your gross estate. The use of the partnership entity allows you to shift some of the business income and future appreciation of the business assets to other members of your family. You maintain management control of the business while transferring limited ownership of the business to family members. Restrictions within the partnership agreement limiting the transfer of the partnership interests may help ensure continuous family ownership of the business. Split-dollar life insurance is another benefit you can offer your employees while investing in your company. 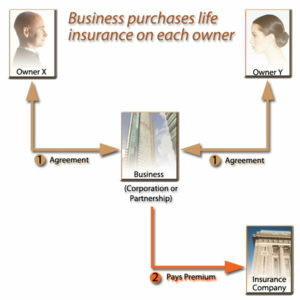 Here, the business purchases a life insurance contract on the life of an employee and shares the cost. If the employee dies, your business receives an amount equal to the premiums paid, and the employee’s beneficiary receives the remaining death benefit. If the policy is surrendered for any other reason, your business receives the cash value. Deferred compensation that supplements a retirement plan is another option you might consider. Your company would buy a life insurance policy on the life of a key employee. The business is the owner and beneficiary. If the employee dies, the business receives the death benefit tax free. From the benefit proceeds, your business pays an annual sum to the employee’s survivors for a specified period. Providing group life insurance as an employee benefit can also help your business by attracting and retaining employees. Group insurance is less expensive to purchase than individual insurance. Also, no medical exam may be required, depending on the size of your company. Here, the premiums are tax deductible to your business, and the benefits are paid directly to your employee’s beneficiary. Certified Wealth Management & Investment, LLC does not provide investment, tax, or legal advice. The information presented here is not specific to any individual’s personal circumstances. This communication is strictly intended for individuals residing in the state(s) of NJ. No offers may be made or accepted from any resident outside the specific states referenced.